Our new Bend hotel is located in the heart of the Old Mill District and is adjacent to the Les Schwab Amphitheater. One of Marriott’s premier hotels in Bend is a quick drive from the many activities on the Cascade Mountains, including Mount Bachelor. A walk along or float down the Deschutes River is steps from our front door. At SpringHill Suites Bend, we pride ourselves on offering the extras that add up to more with our complimentary hot breakfast buffet and evening bar with local craft beer, wine, and light fare. Guests can enjoy favorite local breweries minutes from the hotel including Immersion Brewing, Deschutes Brewery, and 10 Barrel Brewing. Our Bend hotel features modern, spacious suites including a microwave, refrigerator, flat screen TV, and complimentary Wi-Fi. Stay energized in our indoor pool, Jacuzzi, and fitness center with top of the line equipment. 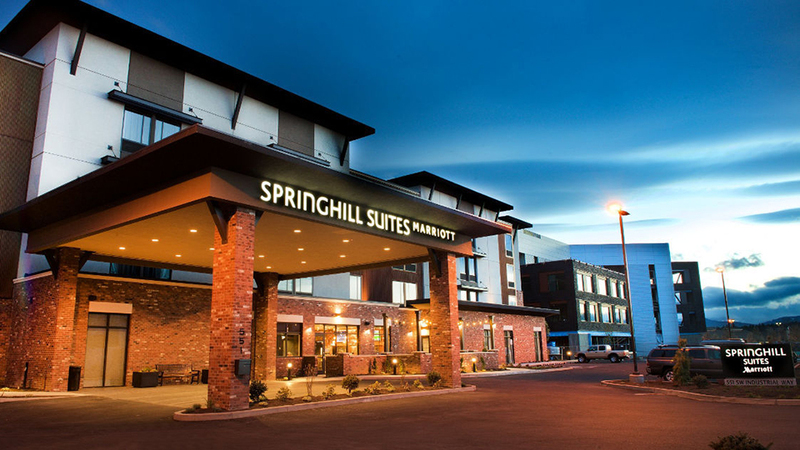 SpringHill Suites Bend also offers over 2,000 square feet of meeting space. We promise to make your stay a memorable one!